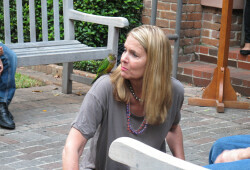 Anyone walking in front of The Bishop’s Courtyard at Christ Church Cathedral, Houston, on Sunday, October 4th would have thought initially that it was a day at the zoo. 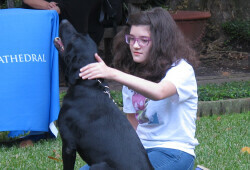 Birds, dogs, cats and a horse joined their owners to receive a special blessing in honor of St. Francis of Assisi, the patron saint of animals and ecology. 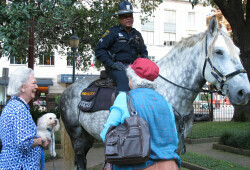 The annual event featured returning visitors Barrio Dogs, Ricco Suave, the Houston Police Department’s mounted patrol and Houston’s Nature Discovery Center. 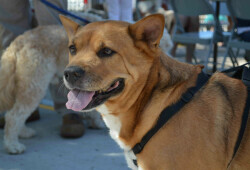 The Cathedral also welcomed K-9 Angels Rescue for the first time, an organization committed to rescuing and re-homing shelter dogs. Fourteen-year-old Emmet Hagen is not new to pet blessings. 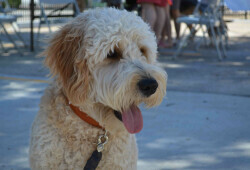 He has brought his dog Jolly for several years. 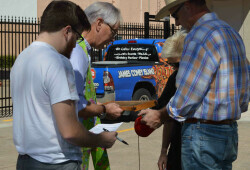 “It brings good luck to her and its great for her to meet other animals,” Hagen said. Lupe Lopez, her two sons and Fluffy, a shitzu-mix puppy, looked like a family from afar, all with matching outfits. 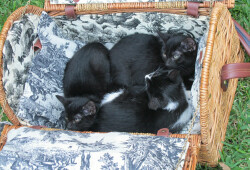 “I had been googling events in the city for [Fluffy] to receive a blessing and this church just seemed perfect. 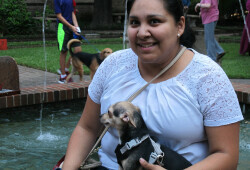 I really liked the fountain here.” Lopez, who was excited to bring her puppy to Christ Church Cathedral. 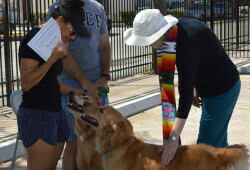 The worship service offered an opportunity for around 60 pets to receive a personal blessing and a St. Francis medallion to celebrate the importance that pets hold in the lives of their families. 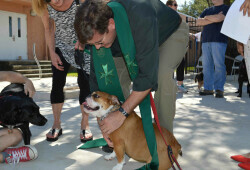 At St. Mark’s in Bellaire people gathered by St. Mark’s Episcopal School’s new education building to recite a short service of blessing for dogs, cats, hamsters, guinea pigs and even a turtle, around 56 in all, before enjoying James Coney Island hot dogs and desserts from a food truck engaged for the event. Lynette Huron, the new children’s minister at St. Mark’s, dressed for the occasion in a skirt covered in cats. 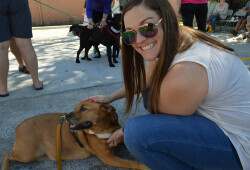 Many of the animals at the event were rescues including a deaf pitbull-mix named Annie, St. Mark’s director of ministries Kim Thompson’s seven-year-old lab mix Grace and the Rev. 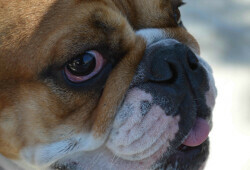 Patrick Miller’s dog Violet. 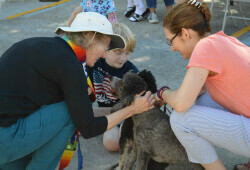 Many Episcopal churches across the Diocese held similar St. Francis Day events, bringing out all types of animals. Known for his great love of animals and the environment, St. Francis invited all of creation to give honor and praise to the Lord. To learn more about St. Francis, click here.